I've been waiting with bated breath for Jandy Nelson to write a follow up to The Sky Is Everywhere for years. As much as I hated the wait, it was all worth it. I love I'll Give You The Sun. Just as much as The Sky As Everywhere, in a different way. I adore the time shiftiness of it. It switches back and forth between when the kids were 13 and when they were 16. Noah tells the story from the 13 year old point of view and Jude from the 16 year old point of view. In the hands of a less capable writer, this technique could go horribly wrong. It could be confusing or pretentious or fake, but it's perfect. In less than twenty-five pages, Noah's young point of view establishes both characters, their family, and their hopes and dreams. Then everything takes a 180 degree turn when 16 year old Jude steps up. It makes no sense at the beginning why the characters' personalities seem so different and why their situations have changed, but as the book goes on things slowly and smoothly coalesce. We see the consequences of small choices and the impact of big events. Arguably, Noah and Jude's lives are not that interesting. Big events have happened to them, but big events don't necessarily take place in this book (not that they aren't important). Basically, it is about the lives of two fairly normal teenagers. It showcases the effect that family can have upon people as well as love, small (and big) betrayals, and regret. Those things are far more interesting to me than huge cataclysmic occasions. On the other hand, there is quite a bit of melodrama in the things that have happened to Jude and Noah over the intervening three years. It would feel ridiculous with a different writer, but in Jandy Nelson's hands, their lives feel normal even mundane. Young Noah is the character I most related to, even though we're nothing alike. He's artsy, sincere, open to love yet scared at the same time. Older Jude is harder to relate to, although I like her better than young Jude. She is hardened and guilt-ridden. But it's hard not to feel sorry for her or to root for things to go better for Jude and Noah. I love this book in a different way than The Sky Is Everywhere. That book I appreciated more for the beautiful writing and the poetry than for the plot. The plot was wonderful as well, but it's not what sticks in my mind. This is the opposite. I think the story will stick in my head, while the writing will take a back seat. This is a character and plot driven novel, whereas The Sky Is Everywhere felt like a prose-driven novel. Neither is a bad thing. They are equally and uniquely wonderful. 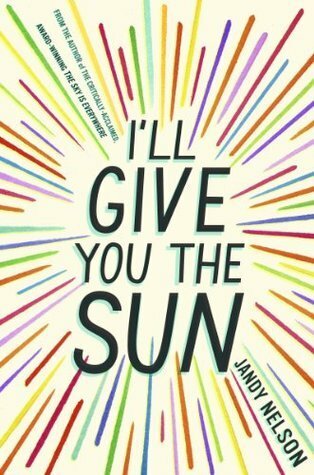 You must read I'll Give You The Sun. It is one of those books that I could read over and over again and get something more out of each time. The writing is marvelous. The characters feel like real people you cheer for. The romances are beautiful, but most of all the relationship between the twins - fraught though it may be at times - is the most memorable and heartwarming part of the novel. I absolutely adored this book and was blown away by the beauty of the prose, but it seems like the writing is even more gorgeous in The Sky is Everywhere (I'll have to read that soon!) Great review! I've read so many great things about this one and I, too, really loved The Sky is Everywhere, so I'm really looking forward to it. Hopefully I'll get started on this one later next week. (That's the plan, anyway.) Thanks! I don't think I've seen a non-glowing review for this book. I'm really looking forward to reading it. Hopefully over Winter Break. Wonderful review! Thanks for this awesome review. I will definitely buy it.